Ever wondered why being next to a waterfall is so cool and refreshing? It’s because of natural evaporation – Nature’s own cooling process. 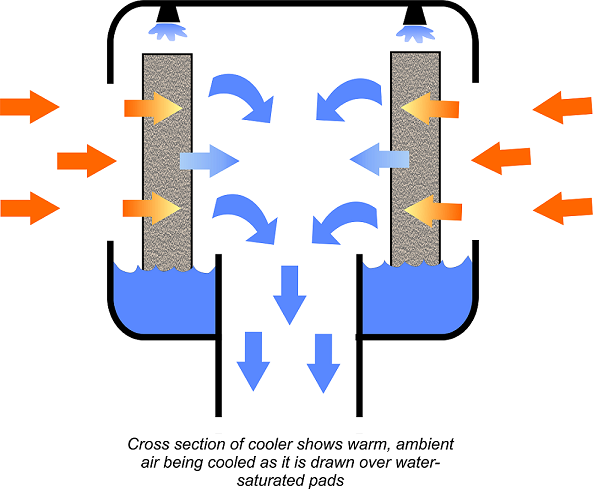 Cooling occurs when water evaporates, particularly in dry climates. Outdoor enthusiasts use the evaporative cooling process when they hang a canvas bag of water in a tree. The water soaks through the canvas container, exposing the surface of the water to moving air. As water evaporates into the air, the water in the canvas bag cools significantly. Your body also uses the evaporative cooling process to keep cool. On a hot day your body perspires and this moisture evaporates into the air, cooling your skin. If air moves over your skin, the process speeds up and you feel even cooler. Breezair employs high-tech features to harness Nature’s process. Breezair brings large volumes of air into efficient contact with water-saturated cooling pads, thereby cooling the air significantly and gently moisturising it too. Breezair provides definite health advantages. Air from outside the building is drawn through special pads saturated with fresh water, and the air is gently moisturised as well as being cooled. 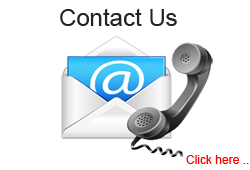 Dust particles, pollen and other air-borne particulate contaminants are trapped in the pads. 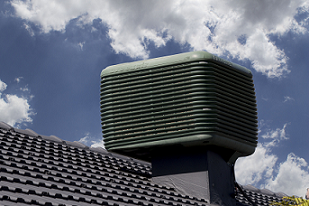 Breezair is therefore beneficial for people who suffer from asthma and allergies. 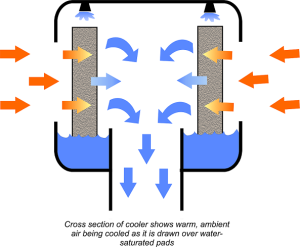 Breezair evaporative air-cooling has a double cost advantage. It costs less to install and much less to operate than traditional refrigerative air conditioning. 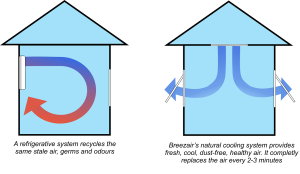 Breezair’s structural materials absorb residual noise and the lightweight fan, with its aerofoil vanes, moves a large volume of air quietly to where it is needed. Breezair evaporative cooling systems are designed to replenish the air in the target space with fresh, cool air within 2-3 minutes. The space will, therefore, be freshened and cooled very quickly, eliminating the need to turn the system on hours before it is needed. 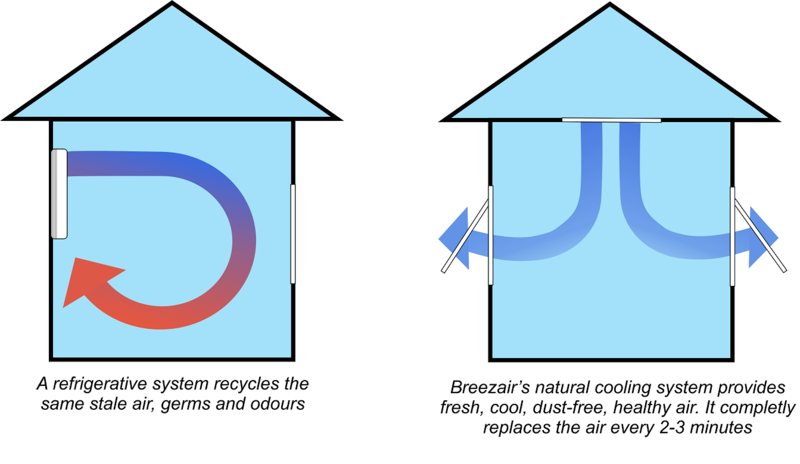 Breezair is designed to deliver sufficient air to the target space so that the air in that space is completely refreshed every couple of minutes. Spent air needs to escape from the space without hindrance through windows, doors or relief vents. This open circuit system eliminates sick building syndrome. People working and living in a Breezair environment feel better and are less likely to be absent from work. Their concentration is enhanced by the negative ionisation of the air and therefore they make fewer mistakes and are motivated to work more effectively. In a Breezair environment, sleep is more beneficial and users report that mosquitoes are less prevalent.